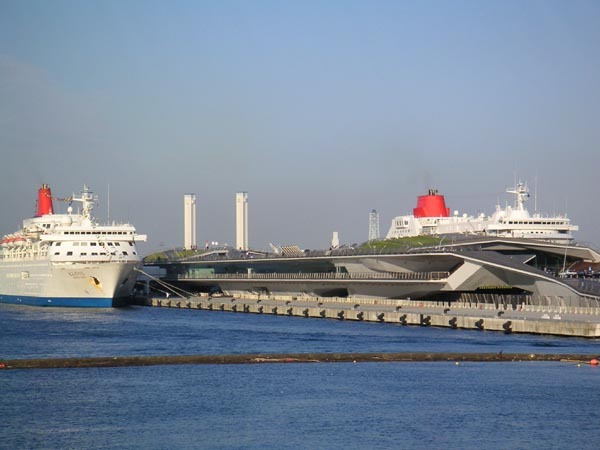 The Osanbashi International Passenger Terminal, also known as Osanbashi Pier, is where foreign cruise ships dock when they visit Yokohama. The rooftop level of this 400 meters long pier is an open-air plaza furnished with wooden decks and natural grass lawns that is open to public. The rooftop deck is one of the best locations to enjoy the scenery of the Yokohama waterfront district. On a clear day, you can also see Mt. Fuji in the distance. You can have beautiful views of the Yamashita Park, Red Brick Warehouse, Skyscrapers in Minato Mirai 21, Marine Tower, Hikawa-maru and the Bay Bridge. The night views here are definitely the best. ​The pier was originally built in 1894. 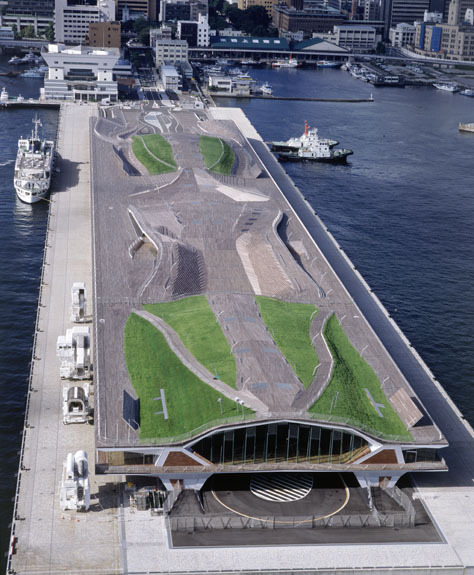 In 1964, the reconstruction of Osanbashi Passenger Terminal was completed in time before the 1964 Tokyo Olympics, but to meet modern demands it was reconstructed again between 1988 and 2002. Osanbashi Pier can accommodate up to four 30,000-ton class ships or two 70,000-ton class ships at the same time. 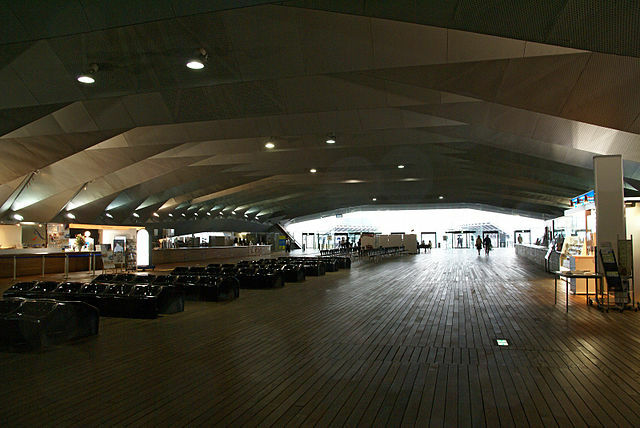 The departure/arrival lobby, ticketing booth, customs, immigration, large multipurpose hall, shops and cafe are all on the 2nd floor of this terminal. There is a parking facility on the 1st floor. 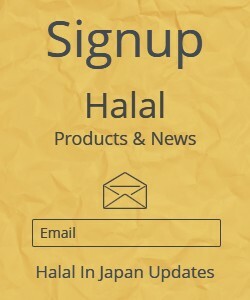 ​The structure was designed by Ms. Farshid Moussavi and Mr. Alejandro Zaera Polo, an architect team operating in UK, who won the project in an International Design Competition, where a total of 660 competitors from 41 countries participated. From Yokohama Station take Minato Mirai Line to Nihon-odori Station "takes about 6 minutes". ​Osanbashi Pier is located between Minato Mirai and Yamashita Park. Since all three attractions are connected by a pleasant waterfront promenade, it is most conveniently accessed by foot from either of the other two sites.